The family road trip: it’s a staple of American vacations, and a source of endless fun…or endless torment. 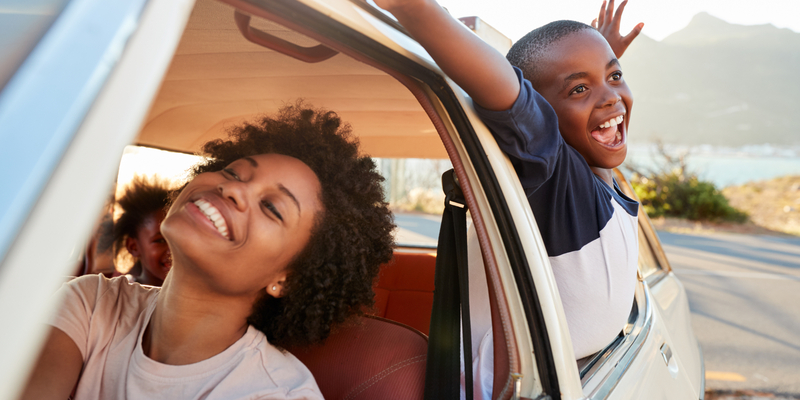 To avoid the 20-times-a-minute “are we there yets” and maintain everyone’s sanity, come armed with some road trip games for kids so those hours pass a little quicker. Get inspired by these nine family favorites. In this game, players attempt to find words starting with every letter of the alphabet, going in order from A-Z. You can look at billboards, road signs, branded trucks, restaurant names, etc. It’s up to you whether to play cooperatively–with each player building off the group’s progress–or competitively, with everyone going through their own alphabet. Either way, when players spot their next word, they call out their letter and the word (“A! Arby’s!”) so everyone can keep track. Some people use the rule that if someone spots a graveyard, they can declare it and all other players will go back to “A”. This is another family road trip game that will test your alphabet skills–and your memory. Essentially, someone will pick a category (the original game is “groceries/food” but it could be animals, places, famous people, or something else), and the family will take turns naming items from that category that begin with ascending letters from A-Z. For example, if one person starts with “aardvark” the next person could follow up with “butterfly” and so on. No self-respecting list could leave out this classic kids’ road trip game! Players take turns selecting an object around them (ideally something in the car or that will remain in sight for a while), and giving the others a clue about it. The traditional formula is “I spy, with my little eye, something [color], or something beginning with [letter].” Feel free to adapt it and have the kids come up with their own descriptive words…but be prepared for your troublemakers to say “I spy something dumb” to refer to their siblings! In this competition, every player chooses a chain restaurant–McDonalds, Dunkin Donuts, Taco Bell, whatever. They earn five points each time they spot their restaurant, see a billboard or road sign with the logo, or hear a commercial for it on the radio. Choose a time limit; whoever has the most points when it runs out wins. 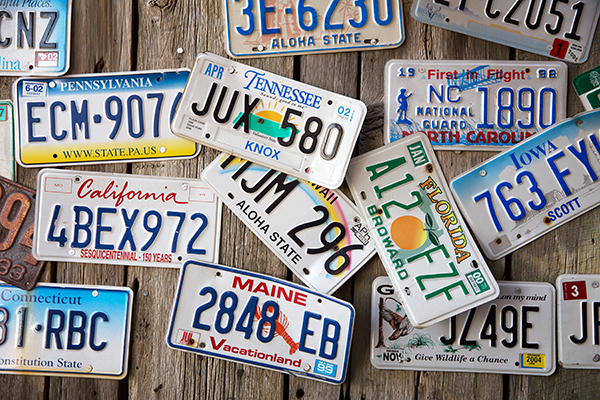 Have your kids “collect” as many license plate states as they can find, writing each one down to keep track. They probably won’t find all fifty (looking at you, Alaska and Hawaii) but especially if you’re driving cross-country, you’d be surprised how many people you’re sharing the road with. This is another kids’ road trip game that lends itself equally well to collaboration or competition: do they work together or collect their own lists of plates? Alternately, instead of looking for states, the kids could use license plates to play a letters-only version of the Alphabet Game. This family road trip game lets kids’ creativity shine. Taking turns, one person will start by saying “Fortunately, [good thing].” The next person will make up something negative about that scenario and reply “Unfortunately, [bad thing].” Then it’s up to the next person to be the optimist, then the next to be the pessimist, and so on. To keep the game moving quickly, give each player five seconds to answer. If they take longer than that, they get one strike. Three strikes and they’re out. Last one standing wins! In the same vein as the above, begin a story with the first sentence, and have the kids take turns contributing the next lines. They don’t have to be fortunate or unfortunate, so the options are endless! This simple kids’ road trip game is a lot of fun for families driving through the countryside. When you see cows on your side of the road, yell “Cows on my side!” You get a point for each time you call a group of cows. If you spot cows on the opposite side, you can yell “Cows on your side!” and steal a point from your opponent. Passing a cemetery? The first person to yell “Ghost cow!” steals all the other side’s points. Especially with younger kids, it often seems like the questions are endless. 20 Questions is a perfect way to get it out of their system. You’ve probably played it before, but just to refresh your memory: one player thinks of a person, place, or thing. The others take turns asking yes-or-no questions; after each question, they get a guess about what/where/who it is. If they don’t solve it after 20 questions, they lose. Of course, you can always bring along a tablet or computer and put on one of these kids’ movies for road trips, but sometimes it’s nice to just engage everyone with some old-fashioned fun. Especially if your trip is on the longer side, it’s a good way to turn those potentially torturous hours into quality family bonding time.